Audrey Hepburn mused, “To plant a garden is to believe in tomorrow.” The VanDusen Plant Sale’s theme for 2018, “40 Years of Connecting People and Plants,” celebrates an event that has made green tomorrows possible for many. Actually, it is the only annual event where free admission gives VanDusen Botanical Garden an opportunity to share its green oasis with everyone. The Plant Sale is about community. As the longest running volunteer-driven event at the Garden it has facilitated enduring friendships. Volunteers are loyal; many ex-Vancouverites trek in from places as far away as Vancouver Island or the Interior on sale day, drawn by a common interest spurred on by an enticing catalogue offering perennials, geraniums, succulents, fuchsias, roses, rhododendrons, vines, herbs, trees, shrubs, native plants and orchids. Equally important, the aptly named, “Potluck” category is full of surprising plants donated or nurtured by volunteers called “Potluckers” in their home gardens or in a special plot at VanDusen. On sale day a line-up worthy of a rock concert begins to form at 7 am for a 10 am opening. The wait is made pleasant by a sense of kinship and creature comforts from home such as picnic baskets and folding chairs. During the sale, congenial and informed advice is offered by volunteers; some are Master Gardeners and most have extensive knowledge. These chats enhance the feeling of “good neighbours.” The Seed Collectors as well as vendors offering plant-related material are also on hand. The first Plant Sale was held in April 1978, chaired by Janet Fraser and Alix Brown. Annual themes from “Planting in Containers” to “Canada 150,” (highlighting red and white plants) have accompanied this event’s growth from humble beginnings in the Garden parking lot to the expanse of the Great Lawn. With the exception of shifting for Easter, the sale has never failed to miraculously materialize on the last Sunday in April. 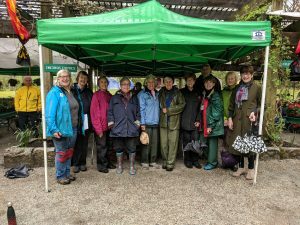 The event has weathered the weather, as Margie Knox, Potlucker and 2018 Plant Sale Chair recalled, “In its forty years there has been every possible weather condition that Vancouver can provide from biting frost, to hot sun to pelting rain.” However, capricious weather is no match for hardy perennials including volunteers and customers! Modern challenges have to be weathered including aging volunteers and stiff competition from big box stores that have greater buying power. To give a sense of the sale’s impact, in 2017 alone, the Plant Sale engaged approximately 400 volunteers and including the proceeds from the Soil, Compost and Manure Sale (held separately), the net profit resulted in $50,000.00 being given to the VBGA for its many projects. The event has always been committed to three unwavering principles, as Margie expressed, “We build profile for the Garden, we supply desired plant material to the gardening public and we raise money to support the VBGA.” Margie described its environmental impact, “Historically, because of the VanDusen Botanical Garden’s plant sale, we have assisted in the greening of the Lower Mainland. You can’t sell 30-40,000 plants annually, many of which are perennials, trees, shrubs or long-term material without making an impact on our community.” The VanDusen Plant Sale has a vision of a verdant tomorrow. It is captured by the sight of the excited throngs running in as it opens and the joyful expression on a child’s face as they eagerly clutch their first plant. Watch a short video below of our first Plant Sale Chair and our 40th Anniversary Plant Sale Chair speak about their passion and purpose.